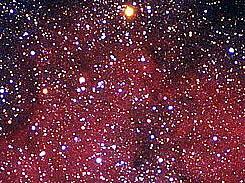 Its name Mu Cephei has got from its deep red color. Not long ago it was the star with the largest known diameter, but got replaced by VV Cephei. The star is the bright dot up in the middle.